Kidney cancer. 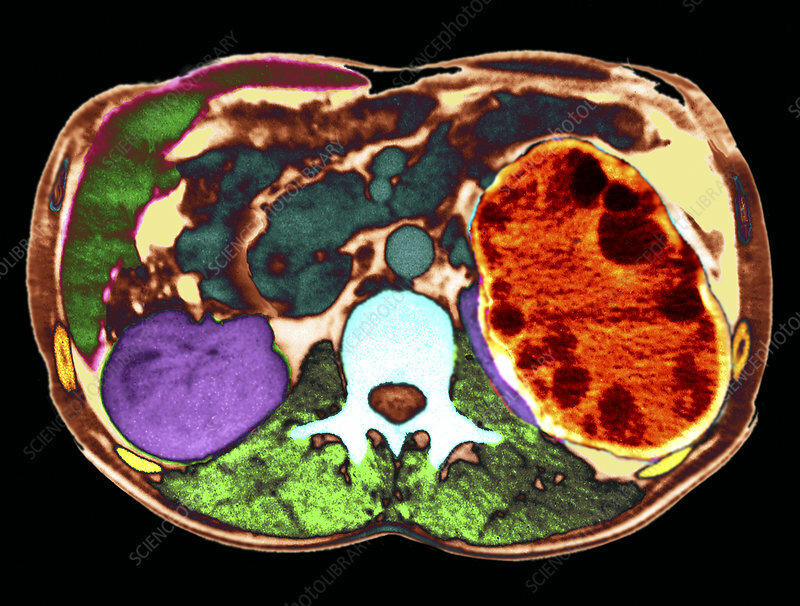 Coloured computed tomography (CT) scan of a horizontal section through the abdomen of a patient with cystic carcinoma of the left kidney (purple). Carcinomas are cancers that arise from the epithelial tissues of an organ. Early stage renal cancer is usually hard to detect, but symptoms may include hypertension (high blood pressure), weight loss and flank pain. Renal cancer is most common in men over 50 years of age, although it may affect anyone. In later stages the cancer often metastasises (spreads) to other parts of the body. Treatment is with removal of the tumour or the whole kidney. In some, but not all cases immunotherapy is also successful.